What my list doesn’t include is a puzzle game that involves getting a ball from point A to point B in a 360-roomscale environment using various tools and gadgets in conjunction with the effects of physics and gravity. Fortunately, Bounce, from Steel Wool, is a game designed to let me know I want what I didn’t know I wanted. I visited Steel Wool a few weeks ago, the same company that just recently received a large $5 million investment from HTC, to demo their new game and get a quick tour of the office. The multi-level space employs a handful of creatives such as animators and designers, in addition to other members of the company, that are all working diligently on innovative new VR projects. The heart of the studio is fueled by a powerhouse group of individuals that came together through years of experience at Pixar. Steel Wool originally made a name for itself as one of the first companies on the West Coast to officially receive an HTC Vive development kit from Valve in the formative years of the industry. Their first title was Quar: Battle for Gate 18, an isometric strategy game for the HTC Vive similar to AirMech Command. Since then, they’ve also released the educational tourism experience, Mars Odyssey, which lets you go on a trip to the Red Planet. Bounce is something a bit different. 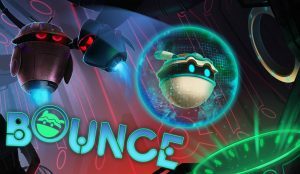 Whereas Quar was the traditional game put inside VR that you could invest dozens of hours into if you wanted, Bounce is a unique puzzle experience created from the ground up just for VR headsets. At its core the simplicity of getting a ball to a goal is mind-numbingly basic, but the small details and steady difficult curve are where the magic resides. The first tutorial level is incredibly simple. A ball drops from the ceiling, the goal is a few feet in front of it. I can spawn ramps with one hand and place them, suspended in the air, wherever I want. Plop down a couple in front of the drop point, slanted towards the goal, and done. That was easy. Each level progressively adds more and more so that you’re never able to relish in your glory for too long. In addition to basic ramps, I also earned access to curved tracks, bounce pads, gravitational pull devices, boost gates, and so much more. Eventually, the developers have even thrown in rings you must get the ball through prior to reaching the goal, moving lasers that must be avoided, robotic adversaries that try to derail you, and even winding, curving, labyrinthine levels that require careful planning and cunning to solve. It’s one of the best examples of taking a simple concept and expanding on it until it’s a fully realized game that I’ve seen in quite some time. While there is a light narrative, that’s far from the focus of the experience. I don’t know how the story ends — that was something that they made particular note to stay tight-lipped about — but there was a lot of thought put into building the world this game takes place in rather than simply constructing simple mechanics that are fun to use in a game space. When I met with Steel Wool, they were already discussing ways it could be expanded even further in future content updates. Having to physically move around and manipulate the world around you changes the dynamic of a puzzle game. Clicking around a screen and moving objects in 3D space each provide very different, visceral, and engaging experiences. The animated short, embedded at the top of this article, is a small taste at the personality of the world this team has built. Steel Wool is planning to release a demo on HTC Vive for Bounce tomorrow on November 15th, with a full release coming later this year. They’re already hard at work on two very large upcoming properties that promise to be much more robust and expansive.